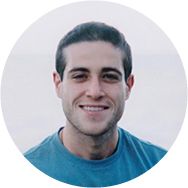 Nate is a mindfulness teacher, health coach, and event producer from Long Island. He came upon meditation as a stressed-out college student at the University of Michigan and has since taught at college campuses and corporate offices across the United States. A behavioral scientist by trade, Nate has contributed to brain research on meditation and habit formation and combines a unique blend of mindfulness, science, and nature-based practice in his teachings. Never one to follow the path most traveled, Nate has also made a living by selling hot sauce, leading humanitarian expeditions, working as a journalist in New Zealand, and as an outdoor adventure guide in Colorado. In his free time, you can find Nate organizing communities relating to flow states, music, and healthy cooking throughout the San Francisco Bay Area.